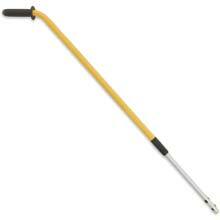 HYGEN Quick-Connect Microfiber Mop Pad Holder Handle - Yellow - 58"
HYGEN Quick-Connect Short Extension Microfiber Mop Handle - 20-40"
HYGEN Quick-Connect Straight Extension Microfiber Mop Handle - 48-72"
Quick Connect mechanism speeds mop assembly and changeover. Strong, lightweight and corrosion-resistant aluminum construction. Powder coated yellow finish.